Photograph from the Curzon Collection, with a view looking north-west from Moulmein across the Salween River towards the Martaban Hills. Moulmein (Mawlamyaing) and Martaban (Mottama) lie on opposite sides of the river at its mouth where it meets the Gulf of Mottama on the coast of south-east Burma. Small islands can be seen midstream. 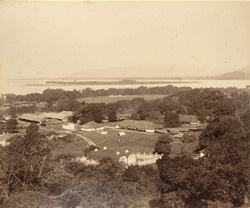 Moulmein, the capital of the Mon State, was the administrative centre of British Burma between 1827 and 1852 and the buildings and land in the foreground, possibly the Parade Ground, are part of the military cantonment established during this period.